What are the advantages of Soundbite over products that create a transcript? Indexing Speed. Soundbite indexes media files much faster than real time, rendering a one hour file searchable in about a minute. This enables Final Cut Pro users to begin searching their daily news, interview and/or scene footage very quickly. Dictionary Independence. Typical speech to text systems can only recognize words found in their specific dictionaries. Phonetic indexing is not dependent on a fixed dictionary, so Soundbite users aren't dependent on updates to be able to find slang, proper names and other topical keywords when they need to. Spelling Errors. Proper names are particularly useful query terms but also particularly difficult for speech to text solutions, not only because they may not occur in the dictionary, but also because they often have multiple spellings. With phonetic searching, exact spelling is not required. If it's spelled like it sounds, Soundbite will find it. User-determined Threshold. If a particular word or phrase is not spoken clearly, or the audio quality is poor, speech to text solutions will likely not recognize the words correctly. Soundbite's lets the user set a tolerance threshold: A high threshold only returns results which precisely match the search terms, while a lower threshold allows results which have lesser audio quality or broader variations in pronunciation. This capability is unique to Soundbite and simply not available in other solutions. What content can Soundbite search? Soundbite searches most common file formats that can be played on your system using QuickTime. Soundbite searches all clips, sub-clips and sequences that are part of specified FCP projects or "watched" folders. Soundbite will periodically check for new media files and automatically make them searchable as well. How is Soundbite integrated with Final Cut Pro v7.x or v6.0.2? Soundbite understands how to read the information contained in your FCP project. It not only can discover and locate the media files associated with a project, Soundbite also reads all metadata associated with those assets. This metadata can be searched in conjunction with the dialogue. Once you find clips that you'd like to add to your project, Soundbite will export the media file reference into your FCP project, along with markers named for the word or phrase that was searched. How is Soundbite integrated with Final Cut Pro X and Adobe Premiere Pro? 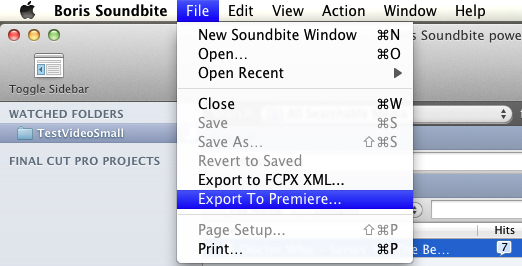 Soundbite v1.1 includes XML export options for Adobe Premiere Pro CS5.5 Mac and Apple Final Cut Pro X.